Those models are from ESF. I hope you realize that by downloading and supporting their "project", you support the awful behaviour of "ripping. Not a single model in there didn't come from the esf community at one point or another. 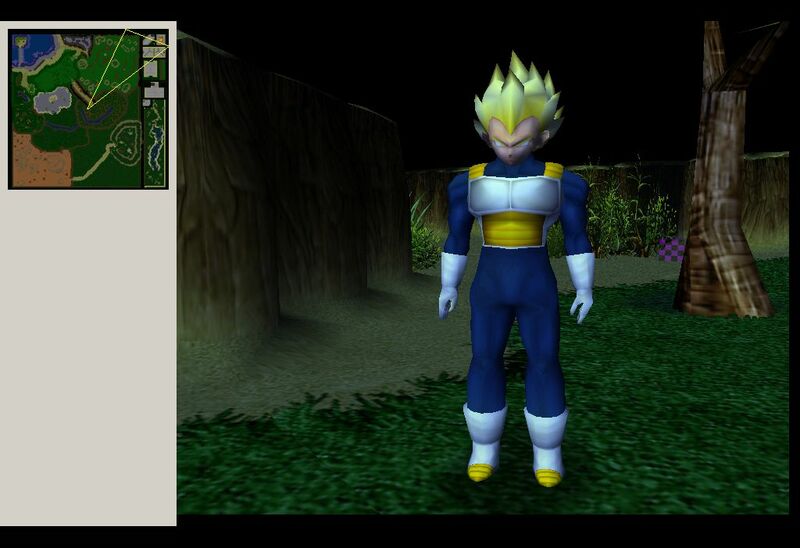 They're using one of the models developed by someone who is actually in the works on Zeq2; Super Vegetto's Vegeta. Although now isn't the time or place to go into a discussion about ethical behavior and considerations to upholding previously-licensed user-created works, I think it'd be best to establish some logical nature to the matter. Every single aspect of every single creation in existence is in one form or factor influenced, represented, or based from another piece of creation. As far as modern practice goes in popular circles, it tends to be common courtesy to ask for permission to use, distribute, or have influence from other user's creations. Outside of these circles, it's pretty much everyone for themselves. Historically speaking, almost all of the great ideas, inventions, and creations of time were, in fact, a base from other works -- most often without ANY permission or notice given. It's how we advance as civilizations. It's how technology happens. It's how art happens. If every creator were to attempt to ask permission to copy or better yet be influenced from another creation, we'd have a lot less potential for great artists like Vincent Van Gogh to thrive. The guidelines for creation would be incrementally hindering so much to the point that you'd have to daisy-chain through a growing list of inspirations and their children so much to the point that the task becomes so meticulous and time-consuming. Passion of the creation would be devastatingly suppressed. This applies in other facets of development as well. Musicians, artists, programmers, and designers in general all benefit from the past creations, styles, and influences of previous forms of their kind. It's well-known that mankind advances through the gains in knowledge of the generation before. While some may not associate the above statements as relative to a project who potentially inserted ESF models into their own work, consider this. The shear inspiration and morale of using such DBZ media already created let the developers of this game focus their abilities elsewhere -- most likely decreasing the total development time necessary; thereby allowing thousands of users to enjoy the project. This actually caused a chain reaction as other similar map types and technical practices learned therein followed post. A beautiful, creative butterfly effect. Furthermore, consider this. ESF was chosen to be a focus for the media for reasons. EVEN in the event that credits were not given or falsely presented, the original authors should feel honored, appreciated, and humbled by the notion that others feel their work is up to par with other development projects. Having a positive impact on a community, group of people, or even the individual struggling artist just trying to learn the 3D or texturing process is something that's VERY post-progressive in the long run. Approaching such types with a harsh, demeaning statement is extremely counter-progressive; severing hope, ambition, and potentially a expanding future. Again. This all is pertaining to mostly communities and fair-usage works (whether they be tagged as so or not). To decline a non-commercial piece of media for the massive creation process is simply a selfish notion that, internet etiquette aside, is a mockery of what the TRUE passion of art and creation are all about. Sadly, morality tends to walk a line laced with natures of manipulative perceptions doused in bias, unbending actions alleviated briefly only to appease a literal web of selfish intentions. Winding things down, the bottom line is this. Even in the event this creation used the ESF characters directly without addressing proper credentials and referencing the source, what purpose would there be in introducing and dragging out a long-winded confrontation and accusation period? What possible selfless outcome could that potentially result in? At best, you'd still be openly triggering a perpetuation of hatred to reach a means that need not be reached. Although human nature be it as it may, incidents where one creates conflict to achieve a moot resolution are among primary reasons why forms of media and the up and coming artists themselves typically found online have so much trouble in progressing at the rates that their historical counterparts did. Why trifle with the progression of humanity as a whole? Fuckdoodles that. They stole ESF's models, we confronted them, they lied and banned anyone who revealed the truth to their ignorant fanbase. That piece of crapdoodle game isn't going to benefit mankind in any way. Your pseudo-profound post is fiddle sticks. The least they could do is give credit where credit is due. If someone just stole everything from zeq2 and made a site called "SUPER ULTIMATE DRAGONBALL Z WARRIORS!!!" and said that they were responsible for all of your work, and you're just some clown who wants attention, I'm sure you'd feel a little angry. I can't even believe you tried justifying their thievery. I didn't bother to read everything you stated, but I did see you made a reference to artists being inspired by Vincent Van Goh. There are differences between inspiration and stealing. An example of inspiration is that if a guy sees the sun set and thinks it's beautiful, he might feel inspired to paint it. For stealing, it's someone taking the statue of David and claiming it as their own. Hm, let's see here. Which does apply? Did they feel inspired when they looked at the game ESF? Hm, let's try that in a scenario now. Say I turn on my computer and find out there are these awesome models out for this game known to be ESF. I think to myself, "Wow! These are so cool!" I then DL them, not caring who made them or what game they were for. "Hm, I feel like playing WoW!," so I start up WoW. After a few hours in, I begin to think, "I should throw these models into WoW and slightly modify the game and claim it as my own!" And so, that leads to the devolopment of the game. I wonder which one that sounds like? Inspiration, or stealing(ALSO KNOWN AS RIPPING). It seems I've reached an impass! Hum, now that I look at the game again, wasn't there a scuffle on the ESF Forums about this game some time ago? I do think your theorie doensn't quite apply here. I remember back in the first days of zeq2 you guys had a fit about some ultimate bfp mod that I introduced on the boards just because it used a lot of models that they didn't create. Don't know what it's called anymore. I do remember they had transformations, 100 plus characters or something and stuff like that. It was good allthough it was ripped. But they itself didn't deserve credit for it. You see if the Esf had died, there wouldn't be much of a problem. But aslong as their alive you shoudln't steal their work or even try to copy it directly and take full credit for it. Fuckdoodles that. They stole ESF's models, we confronted them, they lied and banned anyone who revealed the truth to their ignorant fanbase. That piece of crapdoodle game isn't going to benefit mankind in any way. Your pseudo-profound post is fiddle sticks. First off. Calm down and relax. Now. Lets take a deep breath and continue. Rather than whiplash instantly at the sound of something you disagree with, take a listen and try to propose an intelligent rebuttal of counterpoints in a standard argument form. Basically, your first paragraph just establishes that you have a very strong inkling to the subjects I presented -- being as you fall into the unforgiving, relentless, bias online community stereotype I indirectly outlined. Their actions when you confronted them are, again as my first post predicted, typical to what I would expect. You threw a demoralizing notion at them. Did you expect them to subside all their human nature on how to counter hostility? Lets play wise about things. Besides, their perceived quality and counter-actions play no direct role in this discussion matter -- it's far more generalized than that. Where credit is due in the hands of creation, in general, not just the most recent link in the chain. Again, please read my initial posting to get more details on this ideal. As a matter of fact, it's been done before. Several times. I explained this before. It's a privilege to have someone appreciate your creations to the point as to claim them as your own. We're honored that users actually think of us enough to want to imitate, copy, or become us. Perhaps others will be inspired in the future by subsidiary works as a result, we can only hope. There's no real progressive point in trying to hinder creation as a whole simply because of pride -- be it selfish or shared. Again. Maybe you could possibly at least skim my above post for keywords to help give you some form of subject focus to address. Going in a loop and forcing ourselves to reestablish points isn't going to do our own little conversation progression much good. The mod was called EBFP (English Bid For Power) and I, personally, did support their efforts. It was lead by individuals known as Manuel and IceSaiyan2K if I remember correctly. One of the primary purposes of my above post was to in fact illustrate some level of ignorance that was shared even back then by some members of the team as they protested EBFP. The fact is that they protested it as individuals (not representing the project as a whole) is actually quite ironic given that the original ZEQ is a BFP replacement that uses Rodney Olmos' characters along with a slew of random other character models that were not my own. In my humble editing beginnings, I simply outfitted the media I had with brand new configs, altered attacks, and some other tweaked values to create a fun, enjoyable experience. Incidentally, that experience has lead us to where we are now with ZEQ2. Had I been hindered or negatively rejected by my peers in the BFP forums, I would know very little about game development at this point and ZEQ2/Zios would not exist at all. Simple proof that positive reinforcement has many benefits as compared to a condescending, accusative approach. Zeth, you're wrong. They aren't using ESF's models as a base. They didn't even bother altering the models or adding some flair to them. They straight up stole them, and said they created them. If, during van gogh's time, some dirtbag decided to take his art and tried to become famous for "Creating it", I'm sure van gogh would have personally gone kicked his buttocks. When someone steals something from you, and you have proof of it, you don't walk over to them say "Well, gee golly! How are you doing!" It isn't an honor to have something blatantly stolen from you. They aren't paying homage. They had every right to react the way they did to that piece of garbage wc3 mod. The least they could have done is admit they stole all of the models. I'm not going to address every single one of your points, because they simply don't apply to this situation. Paying homage to something isn't the same as stealing. Neither is trying to mimic a piece of art, and adding to it. That mod does neither. They've been in development for a heck of a long time, and they're still using the models. They don't seem to have any plans to replace them either. After reading your post for the second time, I still can't believe that you tried to justify thievery. I know that unless I kiss your buttocks, you're just going to dismiss my post. Well guys, I have to kind of agree with Zeth on this one. Atleast programming wise. It happens all the time in programming. My point of view is, if it helps you learn take it, afterall, it's redundant to reinvent the wheel. Now I'm not saying all the code I use in ZEQ 2 or ZIOS for that matter is ripped. A lot of what I learned from programming was from examples, taking them apart and figuring out how it worked. Now it's a little different in this case, but they didn't rip all the work now did they? Just the models. And if we want to get technical here, they're not really stealing the authors of the models. They're stealing whomever owns the Intellectual Property of Dragonball Z (Akira Toriyama, I'd presume). heck even ZEQ 2 is stealing his work. So it's ok to steal the models someone spent hours upon hours creating because the law says the character they modeled belongs to someone else. No, you didn't get the point of my post. They're not stealing anything, the original author didn't own it to begin with. Why has society come to the point where we can't even share? Really what good does it do us to keep things to ourselves? Nothing. We can't progress that way. Now obviously if someone outright copied someone to make money, that would be a completely different story. But what if someone were just using it to learn, or make something fun for people to play (note: for free)? Give me a good reason why sharing is a bad idea? My reference did not actually apply in this case. The set of statements I mentioned were a general collection of logical thoughts on the matter. As a result not all of them were specifically directed at the current complication. Again. You misunderstood my comments and applied portions inappropriately. Additionally, your example is taking into account a possible situation, but in a negative connotation. If you take this particular situation into account, you have to consider all other possibilities as well. What if they simply needed needed placeholders until they could develop their own, for instance? Even giving your situation absolutely FULL merit as being true, all I see progressive possibility. Where's the harm in this case? This is not a matter that can be quarreled about legally over financial losses. As a matter of fact, the models specifically in question are already violating copyrights themselves by based from other concepts. Furthermore, the techniques used to develop the textures, the polyflow techniques used when modeling, the animation techniques used, etcetera. Every portion of the media is based on one tier below as far as development goes. The purpose of the pyramid is to climb and ascend tiers bypassing steps in the process to allow humanity to reach their goals more quickly. In your situation, their decision to use ESF models rather than take upon the research and steps to create their own is simply logical and progressive. If indeed you feel there still is an issue, this leads me to assume you believe that if another development group uses assets from ESF, then ESF or it's artists wouldn't receive as much direct accreditation for their already creatively-derived works, right? Exactly. This is completely true. As usage trickles down the ladder, the general peruser could very well easily mistake the creator. It's the idea of a progressive world. Perpetually helping one another selflessly. It's not about limiting progress by meaningless complications, egos, and popularity issues. This isn't some idealistic world I speak of either. The world of programming learned much earlier in it's lifetime that developing similar results each time had little purpose. Libraries have sprouted up to share knowledge and let people climb another tier higher. Of course, that's not all. Graphic emporiums flood out by the day with mesh, texture, and beyond. Large procedural methodology populates both commercial and free markets. Quality, open source, openly available applications and games now litter the web. Everything is pushing towards a more experience-driven, rather than ownership-driven world. How can one claim so boastfully that they created the model themselves without giving credit to the developers that worked hard on the software they used? It's not often you see Adobe's or Discreet's particular developers getting proper thanks for designing aids to help the character designs. How often do you thank the particular designers of the brushes you use in Photoshop, the culling or lighting algorithms of the mesh in general 3D, or perhaps the uvw mapping or modifier techniques you use in 3dsmax? heck. Since we're on a noble quest here, why not continue down the path of credentials. On our journey we'll be thanking the developers of C/C++, assembly languages, microchip hardware, printing card storages, the abacus, various forms of architecture and math, and beyond. We could literally spend days back rooting for the credit process and then weeks longer taking into account each of their influences and "rips". Oh. So you think that's time consuming and pointless? My point is that unless you feel that you'd like to give proper credentials or selfishly claim every thing you create as your own unsharable masterpiece, then you'll have to fall into a third type, a hypocrite. Overall. My point is this. Things are changing and it's getting to the point where communities need to embrace this attitude about development in general and stop clinging to their own works. There's a big difference in softly having an author notice and openly attacking users who partially or completely use your own works in some way. The only real valid reason for denying creative sharing is survival; which would apply in the case of commercial projects that one's life and fiscal situation depends on. In any other case you only prevent progress and substantiate greed. There is no right or wrong in the terms of community mentalities. Only opinions. And your example is crossing the lines. This particular incident isn't about financial gains or popularity. It's simply about having or not having particular media that's public domain (one way or another). Are you honestly suggesting that they stole works whereas ESF (and ZEQ2) creatively stole Akira Toriyamas works? Is there honestly a point in all of your random negative situations and accusations? I don't mind if you present a logical set of statements in a calm, open manner, but blatantly throwing around insults like a bitter youth doesn't exactly support your argument any. At least consider both sides of the situation. I'd like to hear something positive from the opposing side as well just to ensure you don't have a full bias under-belly on the subject. If you had indeed read my post a second time, you'd understand the gist of paragraphs were directed at the community perceived notion of "ripping" as it relates historically and logically -- not so much, although some, in relation to this particular incident. My current post addresses that much more. Tom wrote : No, you didn't get the point of my post. They're not stealing anything, the original author didn't own it to begin with. Give me a good reason why someone should be able to take someone else's work and take credit for it. They are not attempting to "share" anything. They seek only to gain recognition for "their" work, which in fact belongs to someone else. There is absolutely nothing wrong with asking for permission to use something, and then using it. Taking something and then claiming it as your own is wrong. They are not sharing. They are stealing. If I draw Superman, and someone takes it from me and says he drew it, I have every right to be angry. Had he asked me if he could have it, I would have given it to him, at which point he'd be allowed to do whatever he wants with it. Are they using the models as placeholders? I'd consider that a possibility had they been in development for a fairly short period of time. However, they've had more than enough time to create their own models and sprites, or even ask the creator of said models if it would be ok for them to use them. But of course, sharing somehow means it's ok to just take things because you're entitled to anything and everything. This has nothing to do with someone losing money or fame or recognition. What is so hard about asking for permission to use something, or, if that proves to be too difficult, to at least give the original creator of the model, not the character, credit? If someone were to steal the source code to a game and used it for their own projects, the creator/s would be pissed off. To say that they would just smile, and say "that's ok. I love to share." isn't true. Your assumption is wrong, but you already you knew that. Having to asking for permission limits progress? Having to give credit to someone somehow stifles humanity's ability to create? That's amazing. It really is. No one is saying they shouldn't be allowed to use someone else's creation, ever. No one is saying once you create something, it's yours and only yours. Those are words and ideas you've created to give credence to your arguments. I absolutely believe they should be allowed to use ESF's models, if they would but ask for permission first. You're seriously going to try to say a person who models shouldn't be credited because no one bothers to credit what they used to create the model? Did Mark Twain credit the inventor of paper in each of his novels? Should I be allowed to claim his stories as my own because he failed to do so? Come on. Meh I didnt bother to read all of that. I ended with Zeths last post. If you ask me allowing stuff like that is actually worse for humanity. Personally I don't care if they would decompile the models and make their own by making the verts on the same exact position as the original. Thats learning. But just taking the models decompiling them and recompiling them is no work at all. Thus anyone who [img]suports that suports lazyness. I remember last time this mod was posted. It caused an intercomunity war Wich resulted in a lot of people getting banned on both forums. And the lockdown of their forum. They locked it so that noone could join for a while. @Tom While I agree with you that disasembling code and learning from it is in fact OK. Tell me you don't seriously think grabing a program on the web and changing a few lines is enough to release it as your work. And say you made it from scratch. Heck I got some stuff off the web and fiddled with it till I understood what what does. But when presenting my work I never ussed copied lines. I may have retyped some. But never direct copy or edit of something I didnt make. Where has the human pride gone FGS. We ussed to be so egoistic that we only liked what we ourselves made. Henc the "If you wanna get something done you should make it yourself"
Modern man is just another word for lazy bum as it seems. Honestly I wish SV would post in here. That is HIS model afterall. you'll deny it but you did say it. This has nothing to do with credentials or author originality as I've tried to emphasize several times. It's a matter of the re-use principle, open-ended creative sharing, and the concepts of progression as a whole. That was a rhetorical scenario, not an actual suggestion. And yes, the purpose of free usage is to re-use what is already created so you don't have to recreate your own. The difficulty on contact is irrelevant in this case. The matter is that the models existed and were not bound to legal constraints; rather morally subjective ones. Right. Except completely wrong. There's a HORDE of open source software (including games) that follow that exact mentality. Almost all bit-torrent clients, for example, were actually based on the original open-source client rather than whipped up from scratch. I make no assumptions. To assume is to consider validity in truth. I only present view of perspective, just as you, and everyone else here does. In most cases permissions is merely a formality for general, proper etiquette and to maintain fair relations. Failing such permission, heck shouldn't break loose with slanderous cursing and unrelated insults. It's often seen as a sign of respect to ask for such permission, but never should be deemed a necessity. Time availability, contact anonymity, social complications, personality conflicts, historical relations, and so forth are just a few potential issues that can arise. One of the primary ones is mob mentality, (which lucky for me has been graciously proven in this thread alone) wherein a community following generally speaks a few displeasing words about a concept that triggers off mindless, completely provoked conflicts. I think you've missed the stepladder points I was trying to declare, for I was asking you the same questions instead -- not proposing them. This has nothing to do with editing or using completely. It has no relation whatsoever to learning or expanding talents. I remember last time this mod was posted. It caused an intercomunity war Wich resulted in a lot of people getting banned on both forums. Thank you for highlighting and favoring my points in this manner. Basically, a tremendous amount of strife and anguish happened over this simple, trivial issue. Community bonds were broken and in the end, as expected, nothing was resolved. So what was accomplished again by attempting to point out such a minute issue? A dozen bans and bad inter-community relationships. Do you really believe that's the way to make progress? While I agree with you that disasembling code and learning from it is in fact OK.
First off, I don't believe Tom was referencing disassembling code, but rather open-source projects and libraries. Tell me you don't seriously think grabing a program on the web and changing a few lines is enough to release it as your work. And say you made it from scratch. Heck I got some stuff off the web and fiddled with it till I understood what what does. But when presenting my work I never ussed copied lines. I may have retyped some. But never direct copy or edit of something I didnt make. Yes. Incidentally enough, your first statement is EXACTLY what most coders do. Actually, sometimes they don't change any lines even and they still distribute it as their own. It's about expanding opportunity and prevent re-doing things that have already been done. The Zios engine, for instance, uses the Ogre 3D library for handling all 3D rendering. Not one line of code was changed. Is this piracy? Of course not. There are thousands and thousands of projects that do the exact same thing. Unreal 3 Engine? Uses Ageia physics, a free unmodified physics library. Better whale on Quake 3 also, for it uses Open AL -- yet another free open-source library. Where has the human pride gone FGS. We ussed to be so egoistic that we only liked what we ourselves made. Henc the "If you wanna get something done you should make it yourself" Modern man is just another word for lazy bum as it seems. Reuse and recycling is just how progress happens efficiently. If I wanted to develop a new car, would I go out and try to invent a wheel? Then an engine? Then a framework, etc.? Not unless I want to spend a decade or two just doing so to get caught up with current technology. Humanity uses currently existing products for a reason. Technology's ENTIRE fundamental principles are DEPENDENT on it. Let me try to put this in retrospect with a more relative example. Lets say you want to develop a 3D game. You have many options you can go from here, but assuming your stance, we'll need to roll everything ourselves. How deep are we going though? Lets see. Are we using a currently existing engine? No. Add a year. Are we using currently existing libraries? No. Add another year or two. Are we using a currently existing programming language? No. Add another 3-5 years. Are we using currently existing hardware (assembly languages)? No. Add another 5 years. Are we using existing chip technologies for our hardware? No. Add more and more years. As impractical as that might sound now, it was within your context. The point I'm trying to make is this. The more assets your project involves that have no relation to your projects purpose (the unique part), the longer it will take. This is why developers find themselves using currently existing languages, libraries, and engines. It's also why developers might obtain free or bulk commercial texture packages, mesh packages, and so forth to save time and effort. If a developer wants to make a website, they'll use a currently existing content management system rather than write their own. If a developer need icons for an application they have, they'll find an icon set and use it rather than hand create their own. If a developer needs textures, they'll do the same rather than make their own. And finally if a developer needs complete character models, they'll obtain them if they can rather than create their own. As I explained in the car analogy, this is not laziness, it is how progress since the dawn of time has worked. Honestly, what do you expect to happen? After everything I've said, you STILL see a purpose in getting someone upset or riled up over nothing? Creating yet another pointless battle (as has happened in this thread ironically) over a trivial matter. I realize that community mindsets are very influential and spreading, but just take a moment to heed my words and at least understand them before accepting your own views. That was Dragonball Source. We were simply confused in relation to when we announced our comeback in their forums. We violated none of their guidelines and had been previously (and still are) hosting their music and builds as well as offering other random assistance. Our animator, Kevin, received a prompt boot and the thread was closed abruptly despite several public apologies. Strange times indeed. They don't use a similar style, and I wasn't upset. Honestly. Progress is to learn something. Just copying stuff won't make you learn or understand it any better. Its just an excuse for "Im to lazy to learn it so ill simply use whats already there"
Besides those models are not intended as open source you know. Progress is to develop something. Research is to learn something. Had you read my paragraphs SPECIFICALLY designed to counter this statement, you'd have realized that this is exactly how progress happens and has happened forever. One might perceive yourself in fact to be lazy in this case not to read my posts extensively. Open / Shared : Anyone can use or distribute the media in question. This type helps promote progress by cutting development assets. Commercial / Licensed : Although no one can distribute the media in question, this type helps promote financial preservation and typically defines standards of development for future assets. Restricted : The media in question is designed without shared intentions and without commercial intentions. It's only purpose is to essentially hinder progress and limit development efforts simply for it's own ends. While commercial / licensed media in itself isn't exactly wholesome, it does have it's purpose in the continuation of life fiscally to SOME common regard. The primary issue in the above is that restricted media types serve no real progress purpose. Rather than extend themselves to aid potentially hundreds of other developers, they swiftly stop expansion -- a bleak resolve symbolically correlating with an end; death. Like the guy above you. In late sorry, but personnaly, when I have started creating a mod, I have taken the models of rodney and the attacks of ZEQ, not because I was lazy, but because I wanted to start directly, quickly, and then little by little, I wasn't satisfy and I have learned 3D and textures and the animation.